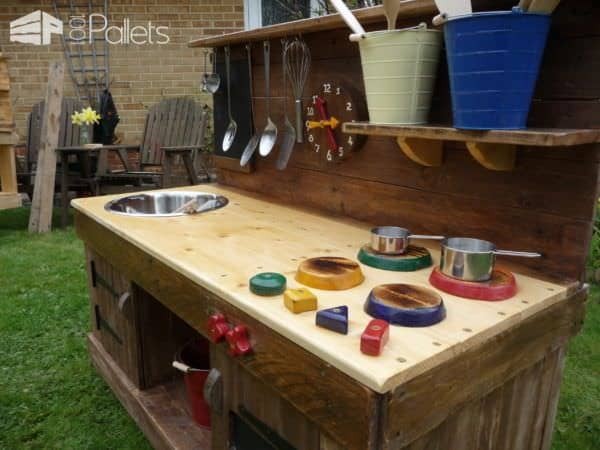 Recycling for a brilliant cause: These Pallet Educational Play Kitchens are both pretty AND functional! 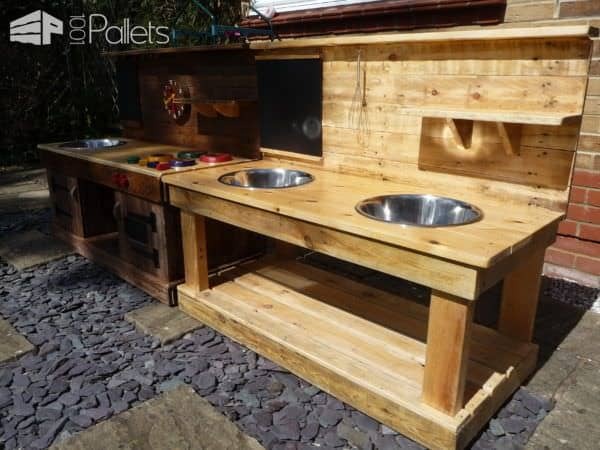 I built this double kitchen from bought timber, but everything else is made from recycled pallet wood. First, I made the frame. The dimensions are approximately 1200mm x 550mm and are made from 90mm x 38mm uprights and 62mm x 38mm cross members. Then I took care to make the frame as level and square as possible. Next, I installed the lower floor and sides. 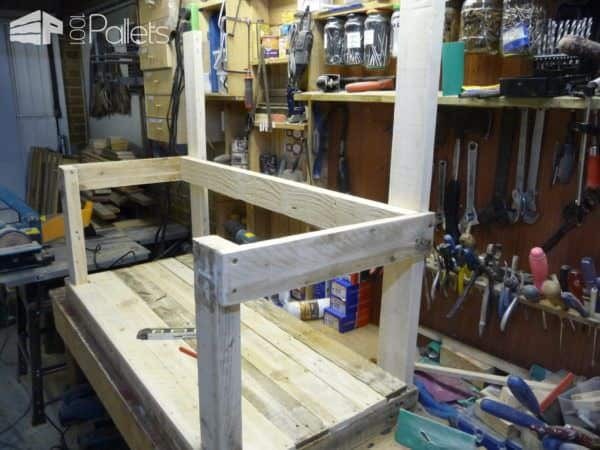 I cut them to approximately 70-90mm wide, 11mm thick pallet timbers.  We designed it, so these kitchens have an oven with a shelf and a storage cupboard. 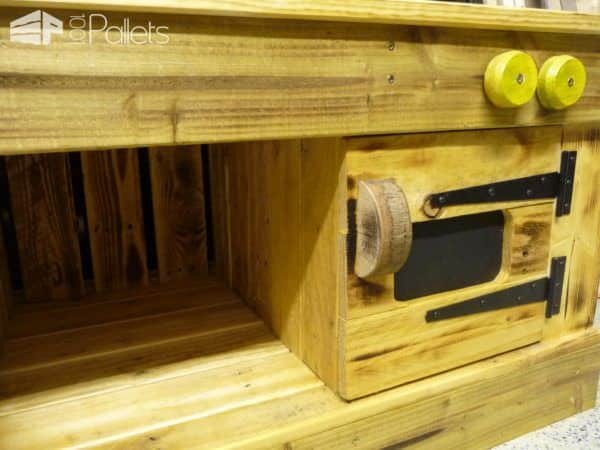 Both have hinged pallet doors with natural log handles. On this one I put a sliding, removable blackboard on one side - this makes it easier for the teacher to write on. (on others I've used whiteboard). 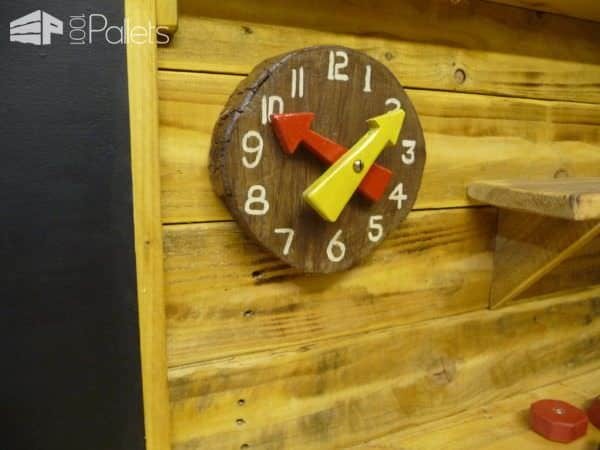 We added a log clock with movable hands for fun. There's a wide shelf at the top with cup hooks for hanging utensils. 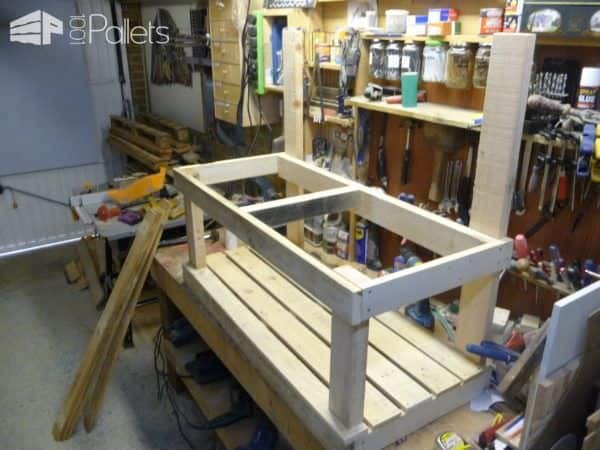 Next, I made a small, wide pallet wood shelf to the right. I used quality pine for the countertops. I screwed and glued the top to give a smooth, user-friendly finish. 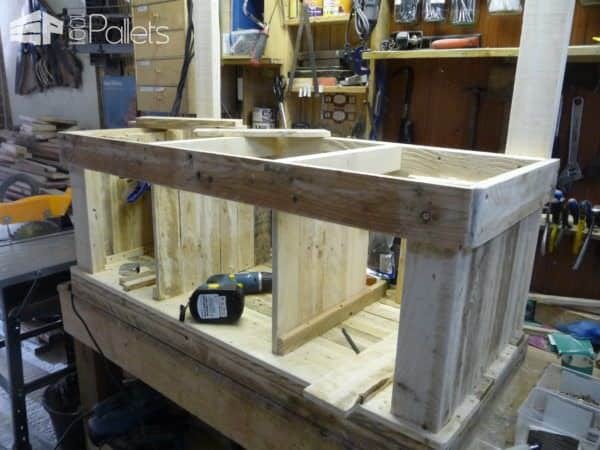 Next, I made the back and side panels from selected pallet wood, and I sanded them all smooth. The color-coded knob and movable controls are cut from wide pallets and interestingly shaped to keep young minds thinking. 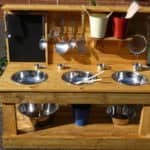 I used two 34mm wide, removable stainless steel bowls for playtime. They can mix all kinds of things: basic mud-pies, dried pasta, rice, grass, pebbles, sand, etc., and the top is sealed for easy cleaning. 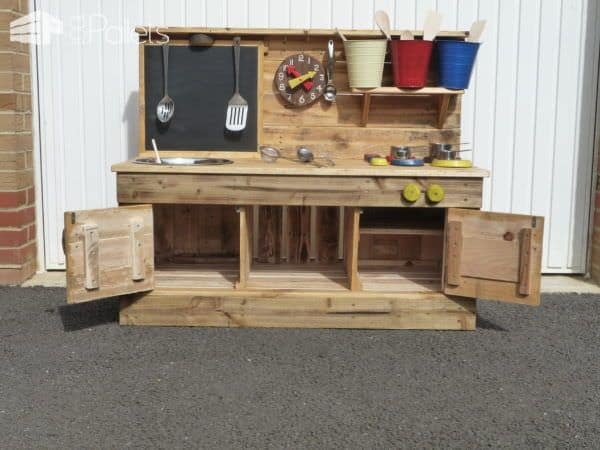 This all makes a very sturdy play kitchen that'll keep young, imaginative minds busy for hours! The overall height is around 990mm and 1200mm wide. The working height I made to 520mm, so it's an ideal height for 2-4-year-olds. I assembled this carefully to ensure there were no protruding screws or rough wood, and all the corners are rounded and child-friendly. 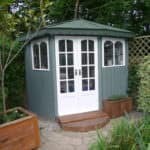 There are various ways to make the frame, but you need to find the design you're happy with and one that's going to give your project strength and stability. 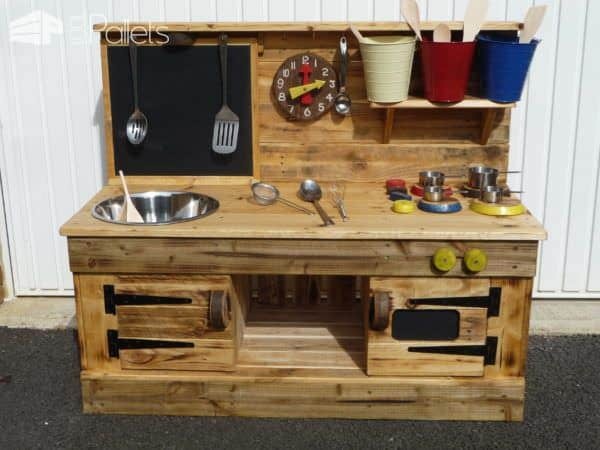 I've found the design for these Pallet Educational Play Kitchens that I feel is easy to construct. I build them in this style because to frame goes around the legs makes the whole kitchen more 'enclosed' and more pleasing to the eye, more 'beefy'. 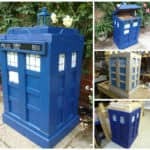 You can finish off with just oil or stain or if you feel more ambitious with paint. The key is to make sure at every step your work is sound and most of all LEVEL and TRUE. If you don't heed this, then your top won't fit correctly. 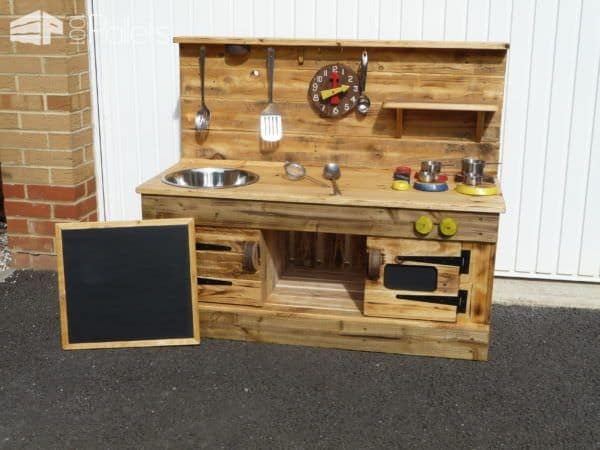 I hope this inspires you to build your own Pallet Educational Play Kitchens.